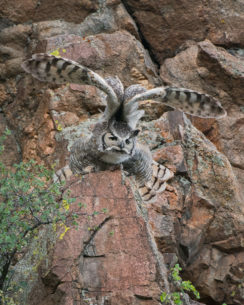 In the month of June it was near dusk when this Great Horned owl started to get active. It was perched in a nice setting on a rock formation with some lichen on the rocks and additional foilage. It provided a variety of nice poses, then it gave me an extra bonus as it stretched its wings and tail feathers.